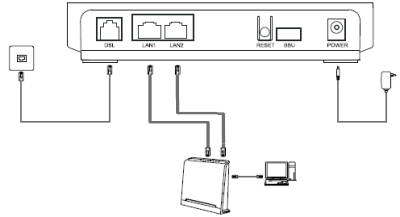 This article looks at how to get your FTTC line stats from the BT Huawei EchoLife HG612 Modem. Most of the credit for hacking and unlocking the HG612 goes to asbokid and other members of the adsl community. This page is a guide on what you require and where to go to get all the resources needed to get linestats from the HG612. What is the BT Agent? How can I turn off the BT Agent? Getting access to stats using one interface. Oct 2013 - BT are currently in the process of updating the band parameters on their FTTC cabinets. New firmware is automatically being rolled out to those modems which haven't killed the BTAgent process. The update seems to remove all files for the GUI, thus stats are no longer available via the web interface. Some users have also lost telnet access. If you are one of those whose modem has been affected, please check the forum for the latest information and news about new firmware. 24/10/2013 - New beta firmware released thanks to the hard work of Howlingwolf. See this thread on the forums for details. If you have an unlocked Hg612 and G.INP has been applied to your line then you must upgrade to f/w version B030SP08 - See Howlingwolf's forum post here for more information and link to B030SP08 firmware. Remember that you cannot upgrade this firmware via the web GUI but must re-perform the unlock procedure for the new firmware to update correctly. 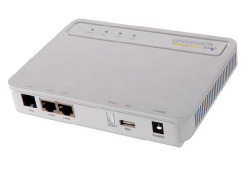 The Huawei Echolife HG612 is currently one of the modems that Openreach is supplying for Fibre VDSL connections. The other modem that may be supplied is an ECI B-Focus. Which modem you get depends on either what type of DSLAM your local FTTC cabinet is, or what the installing engineer has on his van. Although at first glance these modems may look similar, the HG612 is slightly smaller. The ECI has plastic yellow LAN ports, whilst the Huawei has silver metal LAN ports. It is easy to identify which modem you have by looking at the sticker on the bottom of the modem. Unfortunately BT have locked down both of these modems, meaning that you are unable to get details about your connection nor your VDSL line statistics without a little bit of extra work. If you do not have one, these can often be picked up on popular auction sites such as e-bay for anything from 99p to £20. Caveat with e-bay: Avoid paying ridiculous prices. As a guide you should not pay more than £20 for an unlocked version. We have seen some sellers charging in excess of £60 on Buy it Now. Please do not pay this much as you may be better purchasing a brand new combined VDSL modem router such as a Billion/Zyxel/Thomson with a full warranty and future firmware support. See forum if you need help sourcing a modem/router with access to line stats. hg612_unlocked_sp10_firmware which can be downloaded from here. Howlingwolf's firmware B030SP08 which can be downloaded from here. The community would like to thank Howlingwolf - without his work on a new firmware version the unlocked HG612's would not be compatible with G.INP/ReTransmission. Due to the demise of Asbokids blog, full instructions can be viewed from the page Hacking the HG612. ~ I've unlocked my HG612. How do I get my linestats? When you unlocked the HG612 you will have used an ethernet cable between your computer and LAN port 2 of the modem. Now we want to set up the HG612 for internet access with our router to be able to connect to your ISP and also get statistical information from the modem. DSLstats is good for real-time graph viewing, whilst HG612 Modem Stats is good for detailed daily graphs & graph montages over a specific time period. It is possible to run both programs side-by-side as long as time sampling isn't more frequent than 30secs. Be aware that if you telnet whilst both are running then the HG612 may close a session. ~ What is the BT Agent? 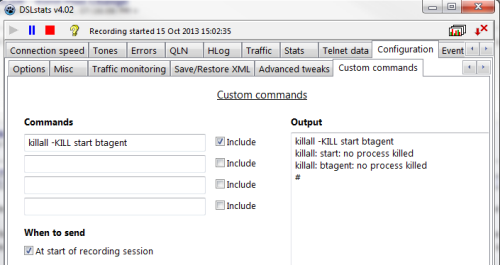 The BTAgent is 'software' installed on all recent BT routers and modems. The full extent of the BTAgent is not known other than it is responsible for communicating with BT's servers and allowing remote configuration. One of the things it is most commonly known for is upgrading modem firmware. Even the unlocked modem firmware will still communicate via the BT Agent. ~ How can I turn off the BTAgent? If you run DSLstats you can issue a command to automatically send to your modem each time DSLstats starts recording. > Tick "Include" & "At start of recording session"
If for any reason you wish to re-enable the BTAgent all you need to do is reboot your modem. ~ Getting access to the HG612 interface for stats over one interface. It is possible to obtain stats via the one interface (obtaining LAN access to the HG612 over the WAN cable). Chrysalis has kindly provided a guide on the forums how to do this with a Billion 8800NL. See also johnwigley's post - Line stats and bridge on same ethernet interface. HG612 Permanent Access to GUI/ Over WAN Alone.